High tech companies try to be clever in their marketing. Often they fail, sounding more nerdish than clever. But chip company Nvidia (NVDA) just made a big imprint -- literally. The company placed a 310-foot crop circle in a barley field about 100 miles southeast of San Francisco last week. The circle appeared in a field owned by farmer Scott Anthony, who was out of town on vacation when the image was discovered. He had employees mow the area, erasing the circle. The intricate pattern repeatedly showed the number "192" in Braille, leading some to speculate whether the number was supposed to represent the atomic weight of the isotope iridium or an Internet IP network address. An IP address starting with 192 indicates a private address used within a given site or company. You might say that it is how a computer or user communicates locally rather than with other sites on the Internet. In other words, it's how you phone home. Some people also apparently thought that either aliens or Steven Spielberg left the crop circle. Anthony said that the image looked like a computer chip. How astute, as that is what it was. 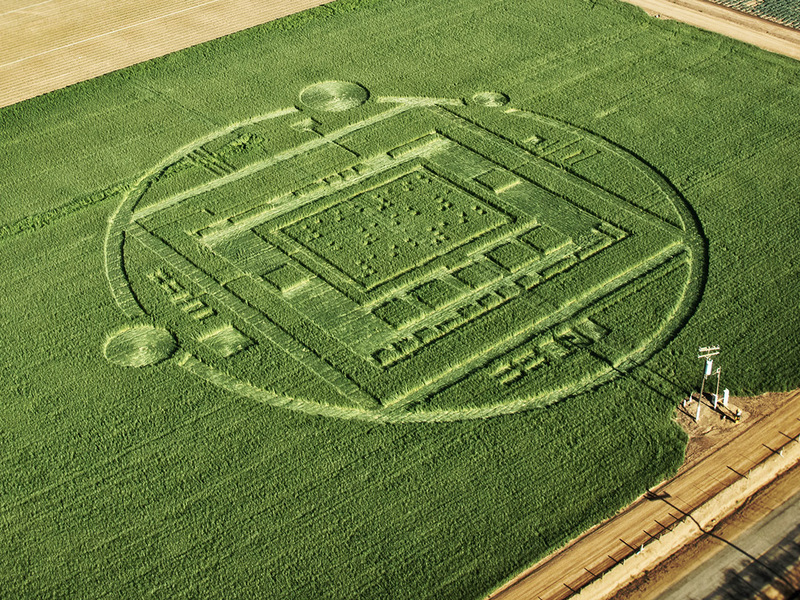 This is the week of the Consumer Electronics Show and Nvidia admitted to creating the crop circle as a publicity stunt. The chip company makes graphics processors for PCs and phones. Nvidia CEO Jen-Hsun Huang said at a press conference in Las Vegas, ahead of the International Consumer Electronics Show, that he had given his marketing department the mission to promote the chip on a shoe-string budget. The crop circle received wide attention. Rumors of Santa Clara-based Nvidia's involvement appeared Sunday before the press conference. Its new Tegra K1 chip has 192 cores, or sections that can process graphics. The more cores, the faster, in theory, the chip can get work done. Such an improvement could ultimately bring computer-like graphics to mobile devices. Of course, there would always be the risk that, while playing a game, users could accidentally get themselves beamed up to a mothership.